The Kobra 270 TS C2 Cross Cut Touch Screen Shredder is an all-rounder performer that ensures high-speed processing and great security. This system features a level-4 security rating. The cross-cut shredder has been designed to shred up to 17 sheets at a time with a maximum speed of 15 ft/min. It produces a shred size of 3/32" x 5/8" particle that is impossible to reassemble. 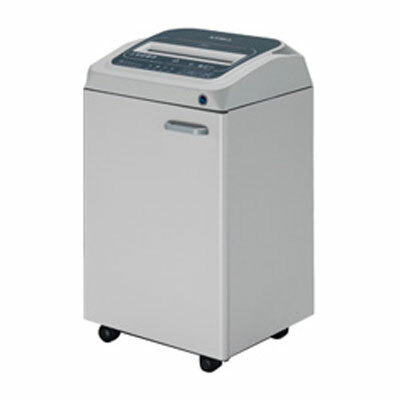 The Kobra 270 TS C2 shredder has been designed to shred papers, staples, paper clips, credit cards, and CDs/DVDs. While its auto reverse ensures protection against jam and blockage, the automatic start/stop ensures operational ease. The cross cut shredder includes Energy smart power management system that helps in saving power by switching the system to standby mode when not in use. Its carbon steel hardened blades deliver high shred loads with low power consumption. The Electronic Power Control system of 270 TS C2 shredder helps in enhancing the shredding efficiency by displaying the shredding load. Dimensions (WxDxH) 21.2" x 17.2" x 35.2"